As President Obama plans to meet Latin America's leaders this weekend, China has recently negotiated deals to double a development fund in Venezuela to $12 billion, lend Ecuador at least $1 billion to build a hydroelectric plant, provide Argentina with access to more than $10 billion in Chinese currency and lend Brazil’s national oil company $10 billion. The deals largely focus on China locking in natural resources like oil for years to come, according to the New York Times. 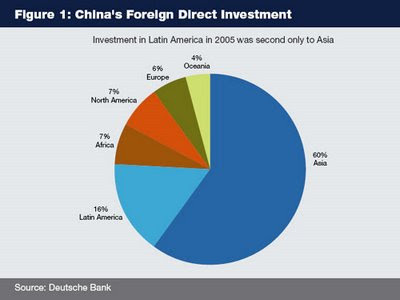 As a result of rapidly growing ties and trade, China has already become Latin America's second largest trading partner after the United States. Beyond locking in the natural resources for its growing industries and developing new export markets, China is also focusing on expanding its own internal consumption of products it produces. Already, China has surpassed the United States as the largest automobile market in the world. In comparison with the rest of the world, the Chinese market for automobiles appears to be relatively robust. Monthly auto sales in China surpassed those in the U.S. for the first time in January, but automakers and industry watchers say the news may tell us more about the troubles in the U.S. than about China's growing car market, says a report published in San Francisco Chronicle. While the Chinese have been actively engaged for years in raising their profile and influence in Asia and Africa, the rising Chinese presence in Latin America seems too close for comfort for the US. It is estimated that the continuing trade surpluses for years have helped China amass a whopping two trillion US dollars in dollar-denominated assets. Last year alone, China added US$450 billion to its reserves at a rate of over a billion dollars a day. About half of the Chinese US dollar-based assets are in the form of US treasury bonds that fund the ballooning US deficits. Gao Xiqing, president of the China Investment Corporation, recently told James Fallows of the Atlantic Monthly, "Be nice to the countries that lend you money". Gao was clearly hinting at this new reality of " balance of financial terror" shifting in China's favor. If history is any guide, the power of the lender over debtor nations is not just theoretical. The key moment when the world leadership passed from Britain to the United States came during the Suez crisis of the 1950s as a result of Britain's large WWII debt owed to the United States. When Britain, France and Israel invaded Egypt to take control of the Suez canal, the US President Eisenhower warned the British that unless they withdrew, he would order the sale of the United States' currency reserves of British Pounds and Sterling Bonds; thereby precipitating a collapse of the British currencies' exchange rate. Eisenhower in fact ordered his Secretary of the Treasury, George M. Humphrey to prepare to sell part of the US Government's Sterling Bond holdings. The British withdrew and ceded the control of the Canal to Egypt. China is exactly going the way in which america went. Using the fund as a weapon cannot run for a long time as it affects the domestic consumption which will force politically for china to look inward. Any slow down in us will have such a bad effect as china has not created a middle class for an internal market to consume the produces. Anon: "china has not created a middle class for an internal market to consume the produces." I disagree. China has already surpassed US to become the world's largest auto market ..a good sign of a strong middle class with growing consumer demand. China's per capita income is 6k vs. 47k of usa which indicates the consumption capacity of the citizens. So a slow down on consumption by america will affect the export oreinted economy. This has already been seen in case of japan. China is yet to create the middle class consumption econocy. Anon: "China is yet to create the middle class consumption econocy." I agree. But China is growing its internal consumption as shown by the auto sales now exceeding those in US. But Asians in general, and Chinese in particular, are big savers. They save as much as 40% of their income which gives them a lot of funds to invest or lend. In fact, they have been supporting the big spending habits of America by lending vast sums in the last decade. But the Chinese are well on their way to becoming a substantial domestic consumer market, rivaling any other by the dint of their sheer size. I have seen it up close by visiting the massive Wallmart stores opening up in China. I discuss international political effects of economic power in In Re: Partition Still Casts Shadow On India-Pakistan Ties. Further issues of china is that it is reducing organized labout cost to keep its product cost low, which is resulting in lower income for people to spend. china has to go a long way for the labour to get his market value for work. When that happens, income get distributed [ cost of product goes up is the issue ] and can reach consumption market. Pls read my views on the theory of yours. ISLAMABAD—Pakistan plans to sign deals worth billions of dollars with China for development of infrastructure and energy projects during Prime Minister Nawaz Sharif ’s visit to Beijing this weekend, Pakistani officials said. Mr. Sharif is to meet the Chinese leadership on the sidelines of the Asia-Pacific Economic Cooperation summit, which starts in Beijing this week. Pakistan suffers from a crippling shortage of electricity and it is looking to its close ally China for a solution. The agreements are part of a bigger aim to establish a Pakistan-China economic corridor that will link south west China, by road and rail, to the Pakistani port of Gwadar, giving China a harbor close to the Middle East, a $35 billion program in total. “Pakistan and China have strong relations and we’ve now decided to take this relationship to the next level of strategic economic cooperation,” Ahsan Iqbal, Pakistan’s Planning Minister, said in an interview. Mr. Iqbal said the Pakistani side’s focus in Beijing will be on energy, with agreements or memorandums to be signed on a series of specific power projects. He said that previously, negotiations had been over the broad framework for the proposed economic corridor. “The Chinese have agreed to invest at a critical time, when Pakistan is really starved of energy,” said Mr. Iqbal. Mr. Sharif will sign agreements on 14 power plants, that will provide the country with 10,400 Megawatts of new generation, said Musadiq Malik, the spokesman for the prime minister. The Chinese companies will invest in building the power stations as commercial ventures, raising their own financing, as foreign direct investment, so Pakistan won't be taking on any additional debt, Mr. Malik said. Another official said that two of the power plant projects are sufficiently developed to begin work on the ground within the next 12 months. The plants are mostly coal-fired. Building power stations on that scale would cost at least $10 billion, experts said. Pakistan will also need to upgrade its electricity transmission network and build facilities to import and transport the huge quantities of coal that would be required. Pakistan’s daily electricity output is generally 13,000 MW to 15,000 MW, leaving it at least 5,000 MW short of demand. That deficit means hours of rolling supply cuts to homes and businesses every day across the country, a situation that economists estimate slashes several percentage points off national income. Aside from China, Pakistan has struggled to attract other foreign investors to its energy sector. Pakistan’s current generation is based on oil-fired stations, which are expensive to run, and gas-power plants that are stymied by a shortage of gas in the country. Pakistan now plans to build plants that use coal, along with limited solar and wind power projects, officials said.